After being down by 14 points to 7 at half-time, the Blues Academy had a strong second half to draw 19-19 with the Nottingham Academy on Sunday. Nottingham started well and were first to score with a try from their strong running winger to go seven points ahead after 15 minutes. Bedford hit back 10 minutes later when centre Paul Aguele scored from an interception. Full-back Liam Shields converted to make the scores 7-7. Notts hit back when a loose pass from the Blues presented them the ball, and they cut through the defence to score under the posts. The try was converted to give them a 14-7 lead at half-time. Bedford started the second half well, when from the kick-off they gained a penalty. The ball was kicked to the corner and a good lineout saw the Blues drive 10m for flanker Jack Spurr to go over for a try, to make it 14-2. Bedford then conceded a soft try from the kick-off. Failing to compete for the ball, they gifted possession to Notts, who kept the ball alive before they exploited a gap in the Blues defence to score in the corner, to make it 19-12. The remainder of the half was evenly balanced, with good rugby being played by both sides. 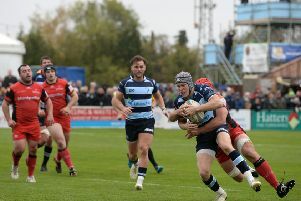 Bedford scored the equalising try with five minutes to go as fly-half Paddy McDuell went through a gap to score under the posts. Shields converted to make the score 19-all. Both sides had chances to win the game in the last five minutes, but the defences held firm and the game finished all square. Blues Academy director Denis Ormesher said: “This was an improved performance on our last few games. “We played the game with much greater tempo and at times put together some good rugby. We made a few errors in defence, giving us a few things we need to work on this week, but we were pleased with the improvements shown. Bedford: Ben Thompson, Charlie Robinson, Henry Peck, Cameron Lawes, Charley Harvey, Jack Spurr, Reuben Pritchard, Rahat Choudhury; Olly Howard (capt), Paddy McDuell; Ross Taylor, Ben Phillips, Paul Aguele, Matt Shacklady; Liam Shields. Replacements: George Harris, George Cave, Oli Pescott-Frost, Callum Strachan, Ethan Hughes, Jacob Turner, Callum Tormey, Malcolm Milligan, Max McMinn.